It helps you to conform pleadings and court-related paperwork to the obligatory formats, following proper procedure, and understanding the technical requirements of your case. Offering advice for navigating both mundane and highly technical procedural requirements, the text clarifies murky areas of conflicting federal, state, and historical procedure. Commentary is arranged according to logical, systematic subheadings. 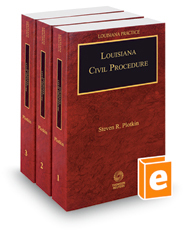 Each subheading section clarifies, comments on, or illustrates holdings from Louisiana jurisprudence, and each volume has its own Table of Laws and Rules and Table of Cases.